It’s back to school time and shops abound with back to school supplies. While there are many pretty supplies for sale, why not jazz up and personalize your supplies to your taste? 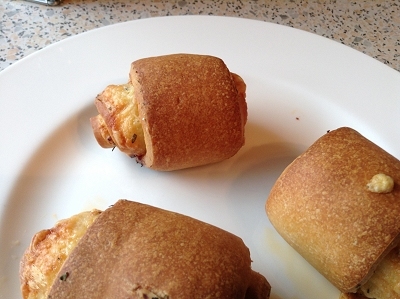 These pizza rolls are an easy, quick, and delicious snack for breakfast or any other time of the day. They can be eaten hot from the oven or cold as a snack to go. All you need is pizza dough, grated cheese, and whatever else you like to eat on your pizza. 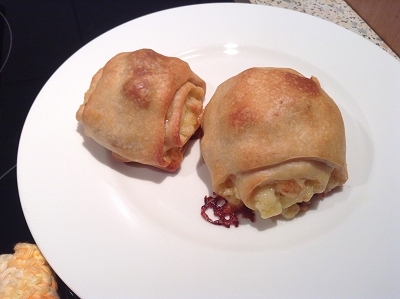 The original inspiration for these pizza rolls came from those awesome Vegan Pizza Snails, but mine turned out more like filled bread rolls you might find at the bakery. I used store-bought pizza dough because it is quicker, but of course you can also make your own. Just make sure to have a square-shaped dough. Cut a few stripes and top them with tomato paste. Roll the stripes into little rolls, try to make sure that as little as possible of the topping comes out. If it does, push it back in a little. With the opening on the bottom, place on a baking tray lined with parchment paper. Bake for about 20-25 minutes. They need as much time as the pizza dough would usually need, but remember that even if they look crisp outside, the many layers of dough in the middle need time to bake through as well. Et voilà! It didn’t take long until they were all eaten up. We like to make sweet pizza, so I thought why not sweet pizza rolls. Top your pizza stripes with crème fraîche or double creme (whatever you have). Get some dried fruit of your choice. I used apricots and figs. 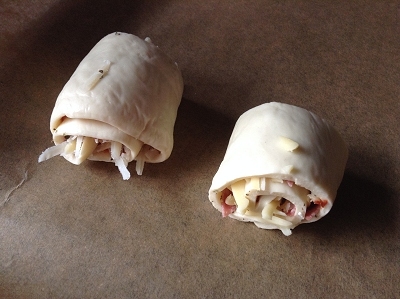 Roll up, place on baking tray and into the over for about 20-25 minutes. All the bookstores are cramped with calendars at the moment. Is it me or do you also get the feeling that calendars come out earlier and earlier every year? Usually, I wouldn’t be thinking about calendars yet for another half year—until mine is used up and they are mostly sold out ;-). However, I’m currently in the midst of improving my time and self management with a vengeance. And calendars play a vital role in good time management. In my quest to a more organized and relaxed life, I’ve come to a point where I have to ditch my beloved tiny pocket calendar and instead go for something I can do my weekly planning in while commuting. I’ve found that daily planning does not work for me. If I schedule a particular activity for a certain day, very likely I won’t do it. If I schedule activities for a week, on the other hand, I can very well motivate myself to do things from the list if I have time. I looked in several shops and did long searches on the internet. As usual, it was exceedingly difficult to find a particular thing on the net if you don’t know precisely how it is called. 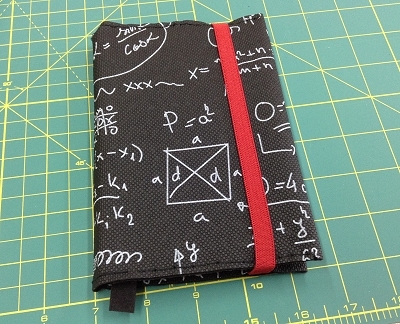 The closest thing I found to what I wanted was a so-called “weekly notebook” or “Wochennotizkalender” for my German readers. It has a double page for each week: the weekdays are on the left to note down appointments and there is an entire page for week notes on the right. I really liked some of the ones I saw, but with all the categories I had that I wanted to take notes for, I could be sure that only one A6 page for notes was just not enough space. I continued working with my planner and wrote a step-by-step guide on how you can make your own DIY Planner. I’m so glad I kept the “binding” flexible! I had to add a couple of pages that I hadn’t thought of before and replaced some that didn’t quite work the way I thought they would. And one very big change had to be made: I was hoping to do my weekly planning in there, but it is just no use. Since it is not replacing my pocket calendar, I just grew tired of copying all my appointments in there, and I didn’t really see the point. For a while I thought I could just use week planning sheets that didn’t have the weekdays on them and have my pocket calendar there when planning. But the second thing that didn’t work out was that I thought I could take a few minutes every morning or evening to look into the planner. That, too, is just not happening. I have way more time to look at all that when I’m commuting. So again, no use to have this in there. I’ve been experimenting with to do list apps for a while, and they nicely complement my weekly planning on paper (because they are good for errands and shopping lists, etc. … i.e. things that are done quickly). But for me they just don’t work as weekly planning devices. I need paper. As much as I love to have a tiny pocket calendar with a nice overview, I just had to admit to myself that I needed a new pocket calendar that would give me some room for doing my week planning while commuting. Long searches on the internet made me realize that exactly what I wanted didn’t exist. I found something called a “weekly notebook” (or “Wochennotizkalender” for my German readers 😉 ), which was close. It has a double page per week with the left page being a normal calendar page with one week and a lined right page for week notes. But I thought that this was still too little space for sensible planning. I wanted one double page for the week days followed by one double page for notes, with my own headlines, preferably. The most important thing for me, though, was that it had to be A6 for the well-known reasons that my handbag is just too small for A5 and that I don’t want to carry so much heavy stuff around with me. My bag is heavy enough as it is.